My ten your old son and his friend came in today and asked if they could make cookies so they could have a bake sale in our front yard. I reminded them that it was 100 degrees outside, and that they might not get any cars that pass by because we don’t live in a high traffic neighborhood, but that didn’t deter them a bit. 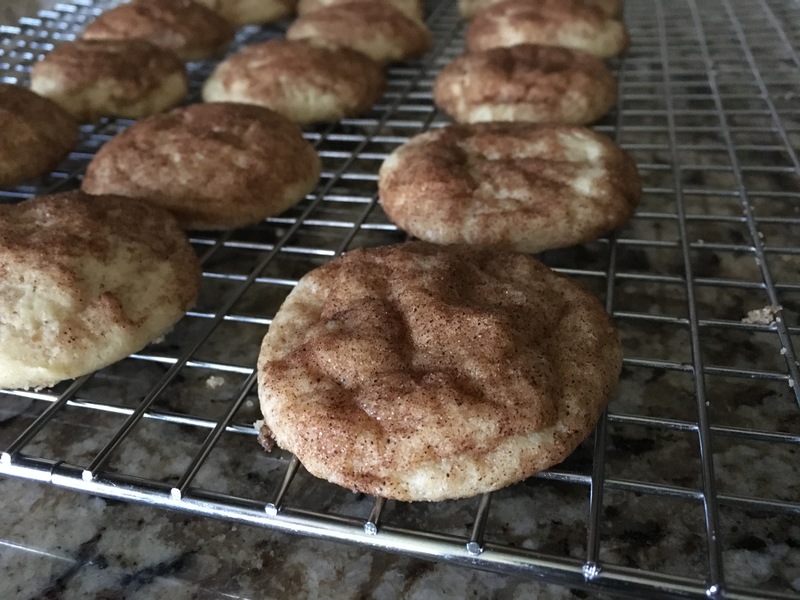 So we pulled out our tried and true high altitude, ‘healthified’ snickerdoodle recipe (because we live in Utah and cookies bake different in high altitude; but this will also work great at lower altitudes as well), which has a wonderful flavor and soft, chewy texture, and the boys went to work, making cookies, with minimal help from me! We used whole white wheat flour in these cookies, but also some white flour, otherwise you compromise the texture, which I didn’t want to do. We also used a less refined sugar, but any granulated sugar works. 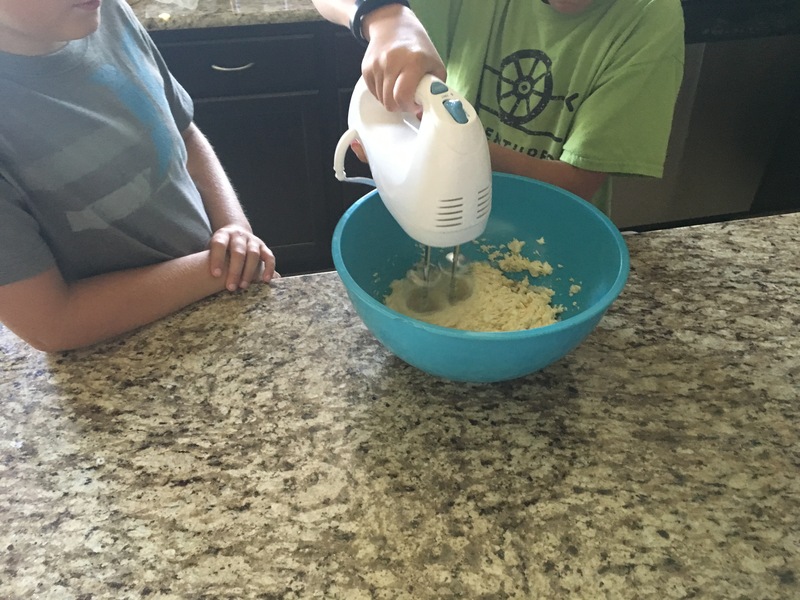 I know, I know, we are cooking with sugar and white flour, which is something I usually try to avoid, but I’m also not a fanatic, and this is what the boys wanted to make so we went with it, and like I mentioned, it wasn’t all bad because this is a recipe I’ve tweaked and ‘healthified’. The boys ended up making some money, almost $6, which surprised me, until I found out that most of that came from one place, our next door neighbors :). Start out by creaming together your softened butter, sugar and eggs in a large mixing bowl. Add flour, cream of tartar, baking soda, salt and mix. Form into a large ball, in your bowl, and chill about 10-20 minutes, until the dough is easy to handle. 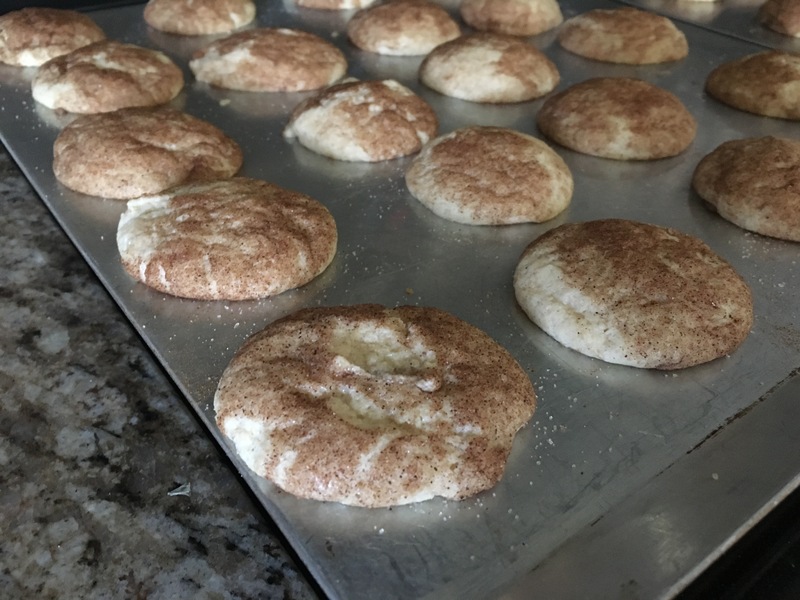 While the dough is chilling, preheat your oven to 350 degrees, put your other ingredients away, and mix together your cinnamon and sugar on a dinner plate, preferably one with a little bit of a rim so the sugar doesn’t fall off the plate. 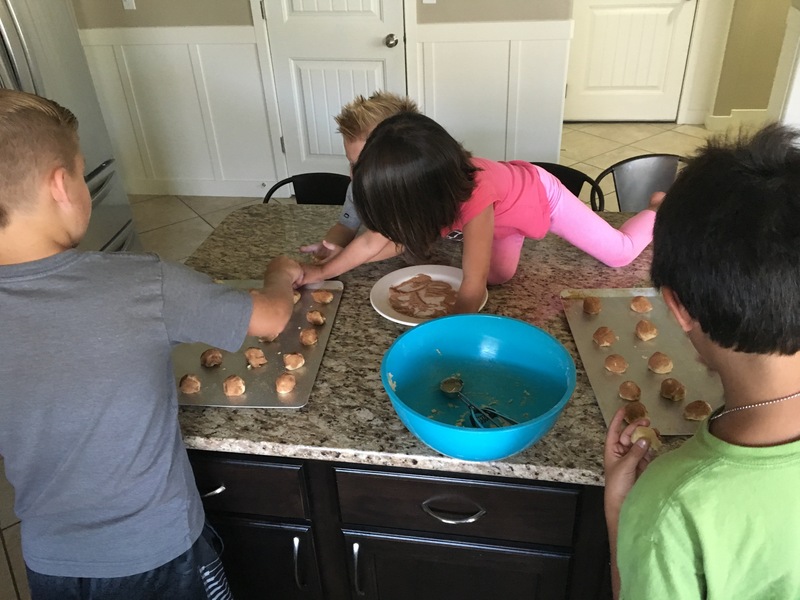 Using a cookie scoop(or a Tbsp), form dough into balls and roll in the cinnamon and sugar mixture. 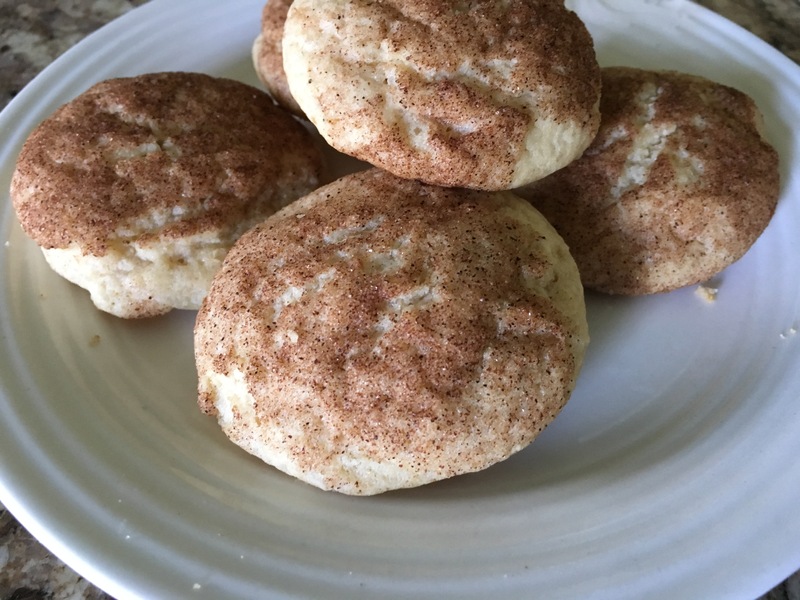 You can bake them on an ungreased cookie sheet, or use one lined with parchment paper for super easy cleanup. They bake for about 10-11 minutes or until golden and firmed up a bit. This recipe makes about 3 and 1/2 dozen cookies. You can freeze them once they’ve cooked and cooled on a baking sheet, in freezer ziploc bag, for another day. In a large mixing bowl, cream together butter, sugar and eggs. Add flour, cream of tartar, baking soda, salt and mix. Form into a large ball, in the bowl, and chill about 10-20 minutes, until the dough is easy to handle. 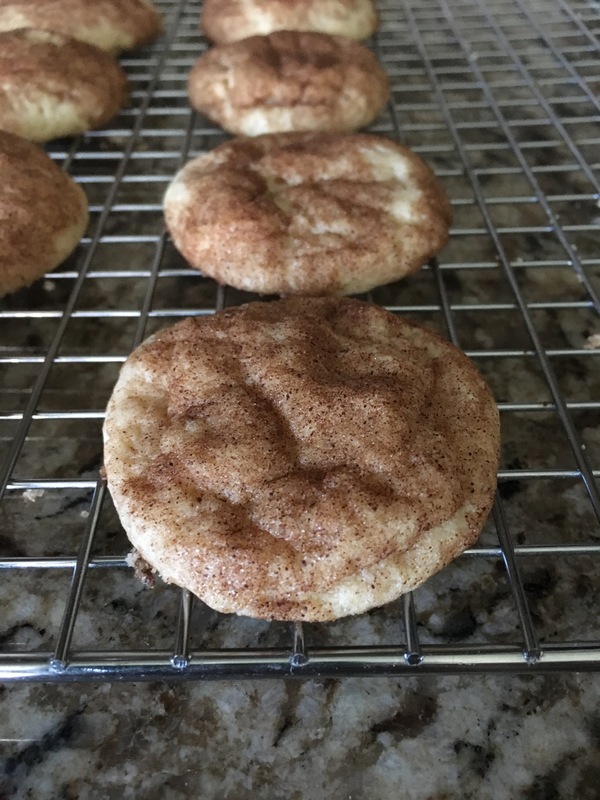 While the dough is chilling, preheat your oven to 350 degrees, put your other ingredients away, and mix together your cinnamon and sugar on a dinner plate, preferably one with a little bit of a rim so the sugar doesn’t fall off the plate. Using a cookie scoop(or a Tbsp), form dough into balls and roll in the cinnamon and sugar mixture. Bake on an ungreased cookie sheet (or one lined with parchment paper for super easy cleanup) for about 10-11 minutes or until golden and firmed up a bit. Makes about 3 and 1/2 dozen. Can freeze after cooked and cooled, in freezer ziploc bag, for another day. We moved last week and so things have been crazy busy around here! We didn’t have internet for several days and even my iphone internet was spotty with the cellular data, which is why there was no post last week. But I think we are getting back into the swing of things around here now that we are mostly unpacked…I’m actually a crazy person and unpack and organize everything within the first couple of days, but there are a couple of boxes in the garage I need my hubby to go through and decide where he wants to put things. Anyhow, I haven’t done much cooking over the past month besides the quick and basic essentials: daily green smoothie, crock pot black beans, quinoa, spaghetti and yeah that’s about it :). Tomorrow I intend to make my granola that we always like to have on hand and hopefully I’ll get some real cooking and experimenting time in over the next couple of weeks. 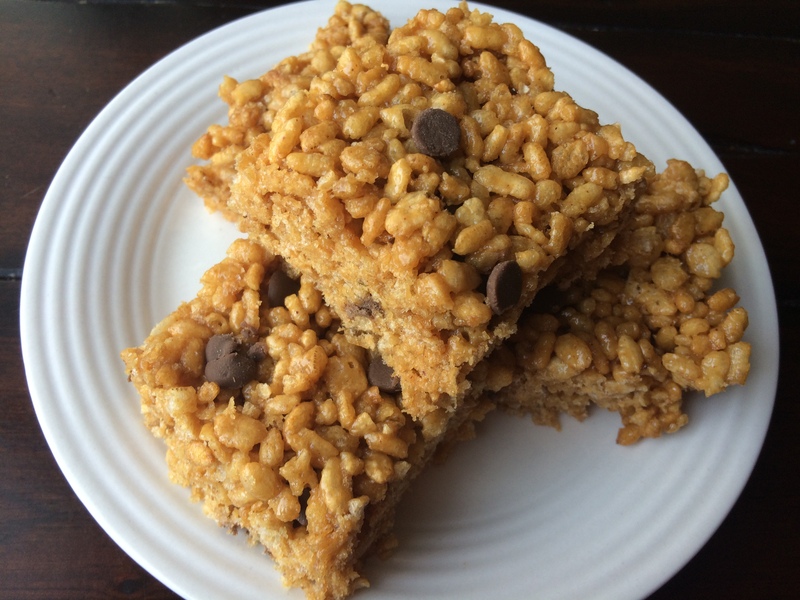 This is a dessert recipe I’ve had for awhile and which we’ve made several times. 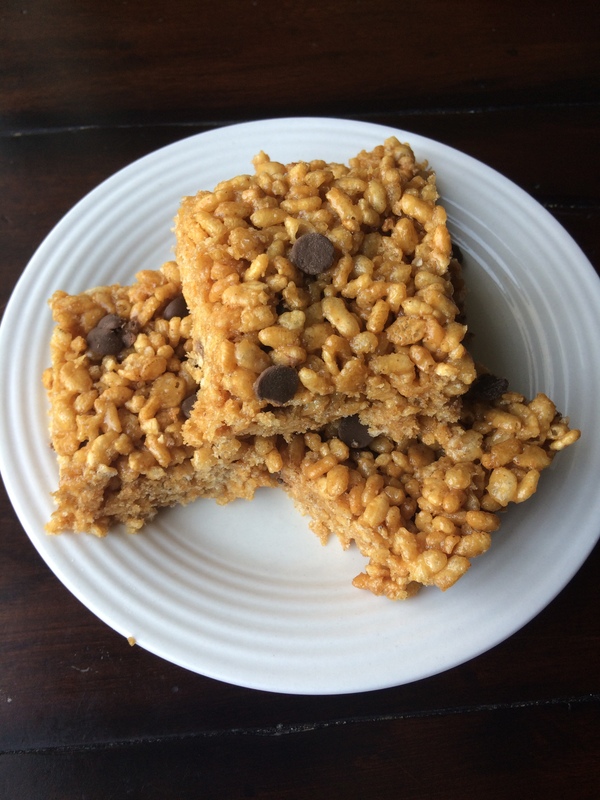 They are a healthy version of a peanut butter rice crispy treat, which are kinda like my no-bake peanut butter rice crispy bars, but there are a few small differences like less peanut butter, no oats, and different natural sweeteners. Give them a try, they are delicious! And they’d be great to serve to friends at a gathering or to sell at a bake sale. I find this cereal at health food stores like Sprouts or Whole Foods. 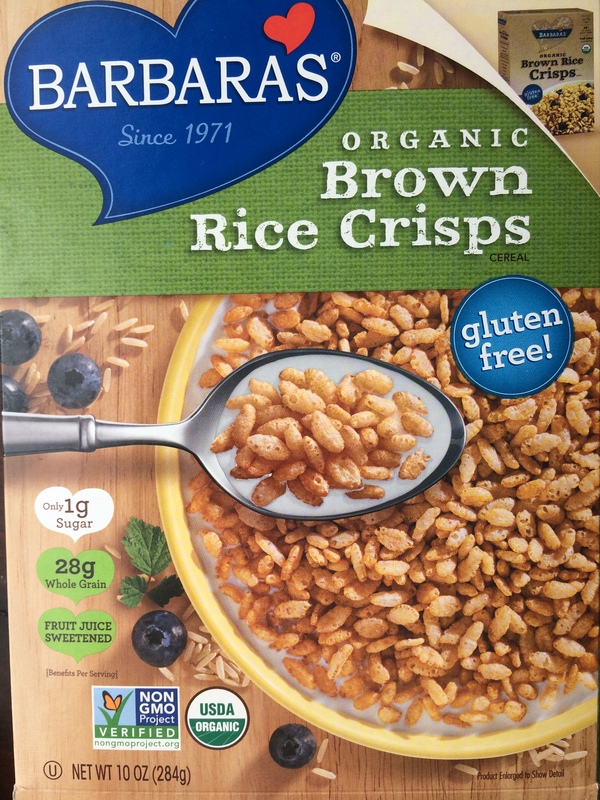 There are a couple of different brands that work well, just make sure it’s the ‘brown rice crisp’ cereal and not the ‘puffed brown rice’. Pour rice cereal into a large bowl. Heat the honey and syrup, with a pinch of sea salt in a saucepan over low heat. Add the peanut butter and stir until well combined. Pour over the rice cereal. Mix well with wooden spoon. Once cooled to room temperature, stir in chocolate chips. Make sure it’s cool or the chips will melt. 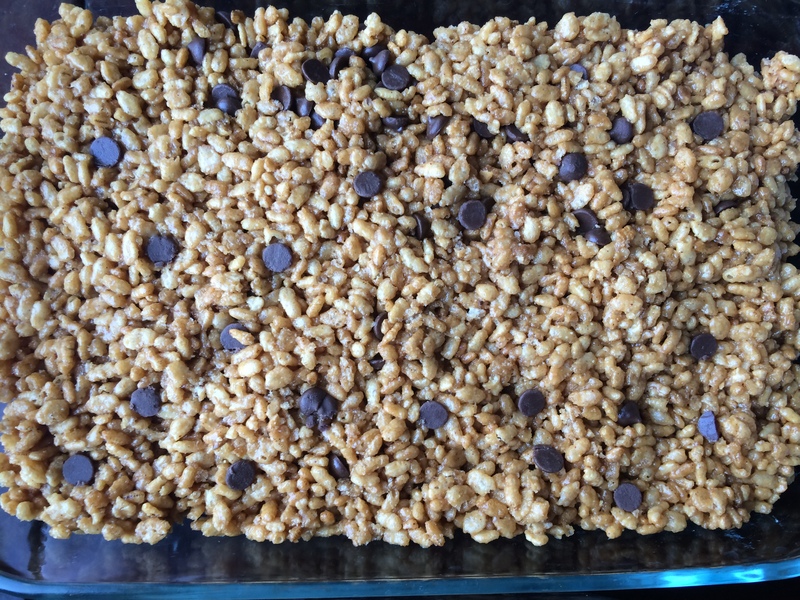 Turn the mixture onto a 9×13 baking dish. Wet your wooden spoon lightly and press the mixture evenly into the pan, or lightly wet hands and press into pan. Let chill for an hour in fridge before cutting into squares and eating (if possible :)). We are currently driving home from Washington, where we travel each year to visit my family. It’s about a 14 hour drive from our house, one way, without stops. We don’t stop much, just to fill up the gas tank at which time we use the restrooms, and maybe we’ll get one meal at a gas station (subway or something similar) and that’s about it. But even then, that’ll still add about 1-2 hours time when 7 people need to use the bathroom :). 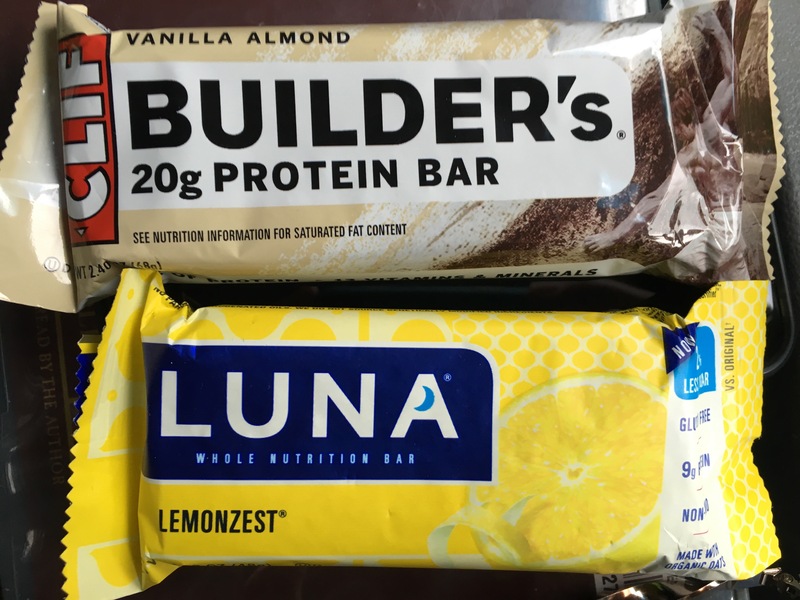 Because we mostly don’t stop for meals, and because I don’t want us to feel gross when we arrive from eating junky snack foods, we have learned to pack some healthier foods that we enjoy and that travel well. First off, the only thing we drink is water, unless I also pack a little green smoothie for myself if we’re leaving super early in the morning. 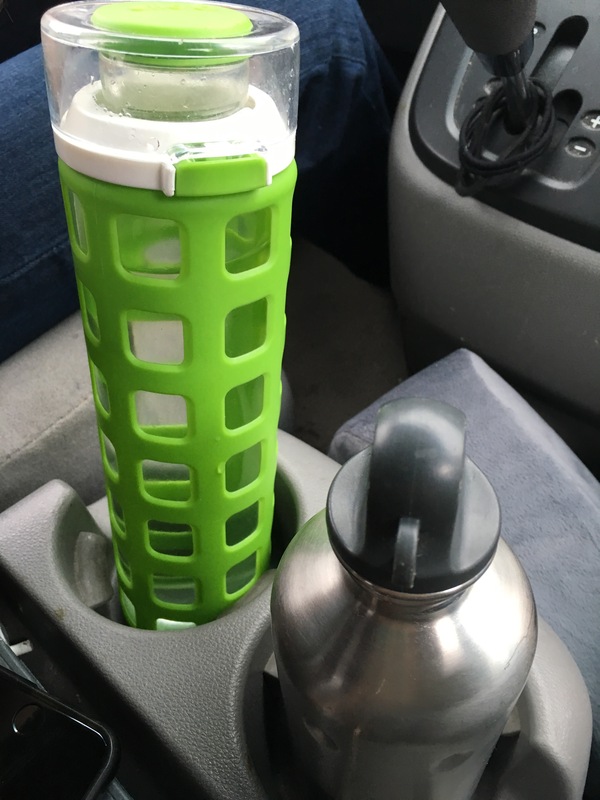 Everyone has their own water bottle, plus we bring a gallon of water for refills. Sometimes we will pack pb&j sandwiches (whole wheat, natural pb, fruit sweetened jelly) for something more substantial, but since we just drove to Grand Canyon the week before, and that’s what we brought then, the kids were kinda done with sandwiches, so instead I packed some protein bars I know they like, which we don’t buy often because they’re not really a whole food with their many ingredients, some of which are hard to pronounce which means it’s not really a food, but it’s okay for sometimes ;). 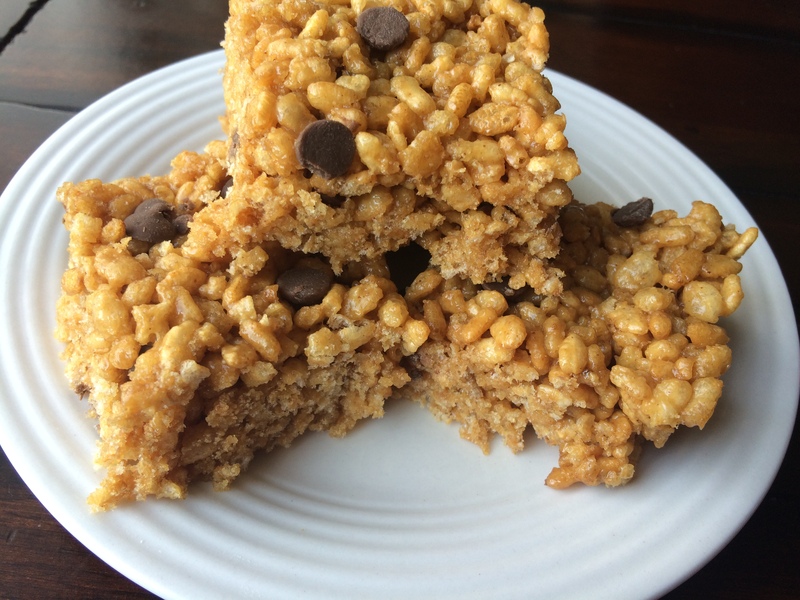 If we had more time, I would’ve made some granola bars or muffins, but as we are moving soon, time is hard to come by and some of my kitchen stuff is already packed; but that would be another good option (if you need recipes, search under the snacks heading on my recipe tab). There are several of us in the family that get motion sick, and I’ve found that snacking on Cheerios (and/or smelling an orange essential oil, and keeping my gaze directed forward) helps to settle my stomach. 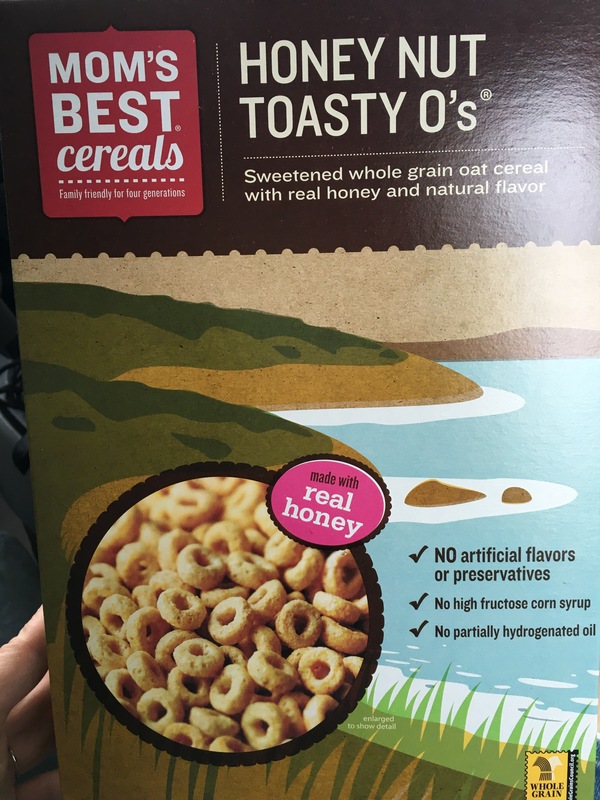 Now, you can find better Cheerios than these with less ingredients, but we were in a time crunch and didn’t want to travel to a health food store and these are still better than most, so we made do. 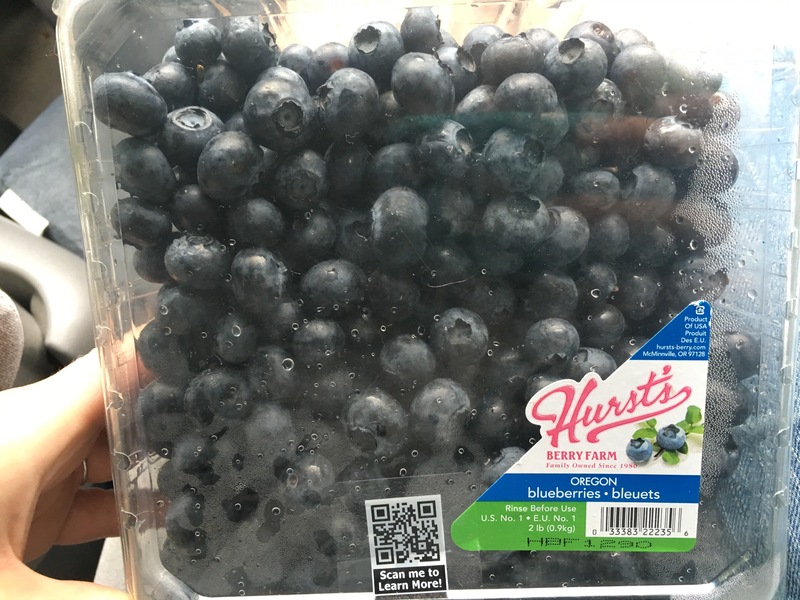 If you, like me, get the munchies on road trips, blueberries are perfect. I’ll eat a handful or put some in a plastic cup and slowly snack while we drive. If you like roasted seaweed sheets, those are another perfect munchies food. They’re not filling, they’re good for you and super low calorie so you could eat a whole package and be fine. Apples are another fruit we always bring because they travel so well. Bananas on the other hand, get soft and bruised pretty fast so I only bring those if I know we will eat them within the first hour or so. These Aussie bites are another more substantial snack. I will usually eat one or two at a time and am good for a bit. Most of the ingredients on the Aussie bites are really good, they are filled with lots of different whole grains. And Scott and I think they’re very yummy; we find them at Costco. 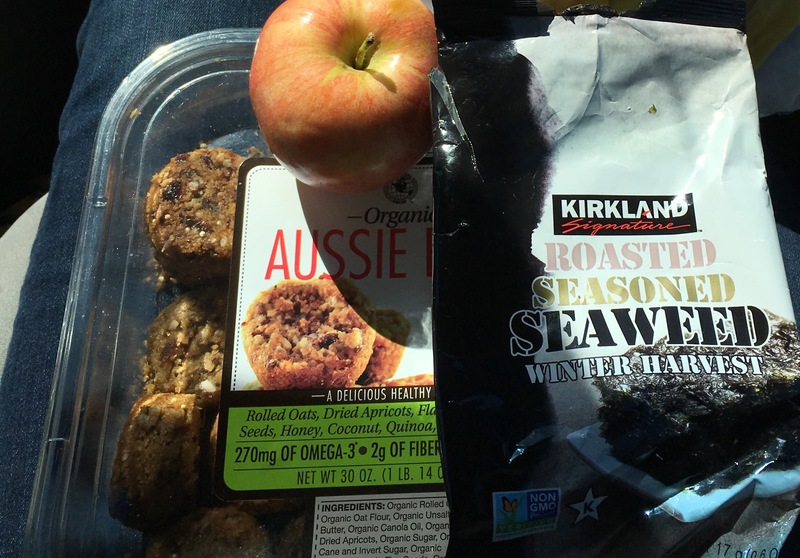 Rice cakes are another good traveling food, as are cashews, pistachios, sunflower seeds (the shelled ones help my Hubby stay awake when driving) all nuts really, grapes and the kids always enjoy it when we pack some gum. It’s nice to pack some fun things, but it’s also nice to feel well when we travel and when we arrive and these foods have worked well for us. I hope this helps you as you get ready for your travels!